Franchise Players is Entrepreneur's Q&A interview column that puts the spotlight on franchisees. If you're a franchisee with advice and tips to share, email ktaylor @entrepreneur.com. Six years ago, Allentown, Pennsylvania, was short on tax preparation, but to Paula Paredes, an immigrant from the Dominican Republic, it was long on opportunities. Paredes knew nothing about taxes, and hardly enough English to run a client-heavy business. But she was undeterred, and hers became the true Independence Day entrepreneurial story: She opened an ATAX tax-prep franchise -- her daughter translating by her side -- brought her English up to speed and in the process realized her own personal version of the American Dream. Best of all, Paredes discovered a close ally in Rafael Alvarez, founder and CEO of ATAX and, coincidentally, a fellow immigrant from the D.R. Franchise owned: Allentown, Pennsylvania. Originally from the Dominican Republic, Allentown resident for 22 years. I have owned my ATAX location since 2009, six years ago. I am 50 now, 44 when I started the business. Just prior to launching my ATAX business, I discovered a huge void in Allentown for trustworthy tax preparation services. My family and I talked about starting our own small center to meet this need. However, none of us knew how to prepare taxes. So, I looked into training for this and came across a class that Rafael Alvarez, the president, CEO and founder of ATAX, was hosting in New York City. I went to the class, and he was very helpful. As a result of attending this training, I became more interested in the support Rafael and his team could provide, as well as the ATAX name brand. Thus, I decided that because of the support and know-how behind ATA, it would be the right decision for me to franchise my center. It was the best decision I could have made. The support has been outstanding. Rafael is a wonderful leader. 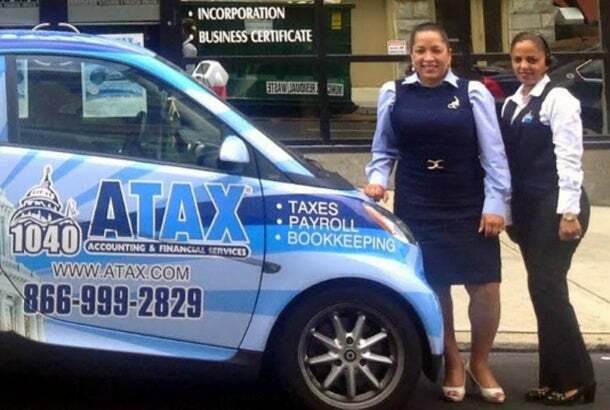 And, my office is now number one in the ATAX system and the leading tax preparation, payroll and bookkeeping provider to individuals and small businesses in Allentown. I even host a radio program on the topic. I came to America in 1993, after having worked office desk jobs in in the Dominican Republic. I was in management-level positions. But my husband and I wanted to move to America because we could see the challenges of the Dominican economy, and we wanted to provide a better life for our children. When we arrived, I knew very little English and could not go back to an office setting without being able to speak English. Thus, I went to work in a factory setting. Nonetheless, my work ethic never changed. I became the highest-performing employee at the company, and worked in a number of roles there. When I chose ATAX, I did it because I knew that I could have a positive impact on the Allentown community. There were far too many people in my network that needed help, both individuals and small business owners. So, now, ATAX gives me the tools I need to make a meaningful difference in the community, yet own a business that provides me a challenging career and the lifestyle I seek. Additionally, ATAX seemed like the right fit because, in comparison to other tax-preparation franchises, ATAX offers a year-round business model with our bookkeeping and payroll services. When I started the business, I spent a total of about $15,000 to launch the business. This included the franchise fee, office set-up and materials needed. In general, it was not a high-price franchise investment, and today it still falls into the lower-cost franchise category. My husband and oldest daughter were very helpful. My daughter encouraged me and stood by my side, helping to translate English for me. At the same time, my husband was fully supportive. Once we discovered ATAX, he said to me that this would be my opportunity to get out of the factory work. Finally, Rafael Alvarez, the founder, CEO and president of ATAX, was extremely helpful. We’re both Dominican immigrants and relate very well to each other. In fact, my husband and daughter often refer to me as the "Rafael of Allentown," or "Rafaela," sometimes. In my own mind, I knew that if Rafael could do it, I could do it too. Related: Owning Your Own Business Means You Can Work Whenever You Want – As Long As It's Every Day. I didn’t realize just how challenging not being fluent in English would be for me as a business owner. But it proved to be a massive challenge. I overcame it on several levels, including hiring a full-time employee who was fluent in both Spanish and English. In the beginning, talking with lawyers to get the business started and our early customers was challenging. My determination to overcome this obstacle has been the key to my success. Number one, find a franchise that is in an industry you like or that requires the skills you excel at professionally. You should love what you do. Number two, work your business; you cannot be an absentee owner. You have to be dedicated to the business and work in it before growing too soon. Then, once you hire staff, be there to train, guide and mentor. Finally, keep an eye on the future, while you're tending to today. If you want to reach your goals, you have to keep a vision clear in your mind about where you want to be and what it will take to get there. With ATAX, we have always had big dreams and now we’re looking to expand to more locations in Allentown. Currently, we are in growth mode on two levels. First, we continue to expand our existing office’s client base; We are always marketing the business hard and actively participating in community events. Next, we are pursuing a second location in a different section of Allentown. We see a bright future for us in Allentown with ATAX.